Back on World Chocolate Day in September one of the things your Chocolate Priestess found in her nearby Kroger were a few different types of filled chocolates from Poland. 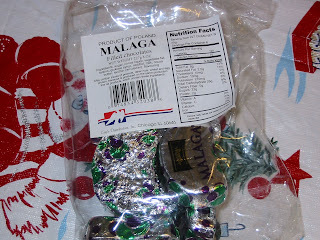 I bought the ones called "Malaga" in a 8oz or 227g bag. They came in this clear bag with a label on it listing all of the required information for the USA. Inside were these crescent shaped, silver foil wrapped candies with green and purple designs on the foil. The bag contains 6 servings of candies each with 190 calories, 2.5g saturated fat, <5mg cholesterol, 10mg sodium, 23g sugars, 2g protein, minor amounts of the four required vitamins and minerals on the label and oddly 210mg of potassium. This is not an all natural product and sugar is the very first ingredient. It also includes raisins, cocoa liquor and butter. The indiviual pieces you can see here laid out as a Christmas tree because I took them to a recent visit at a friend's house, were over an inch long and about half an inch wide. They smell sweet with a hint of chocolate. That was how they tasted too: sweet with a hint of chocolate. In fact, surprising sweet, almost overwhelming sweet. Their texture was odd, a bit like a honeycomb style candy which is what these reminded me of. The degree of sweetness over cocoa here means I am unlikely to buy this again but for those of you who like heavy levels of sweetness you might want to check this out. Sisters and Brothers, may you too take the time to slowly appreciate what the Divine and human ingenuity have offered you in chocolate. 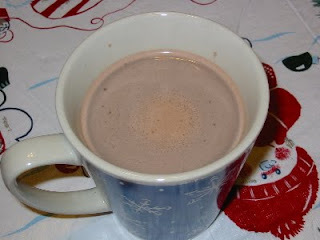 Time for another hot chocolate drink review from your Chocolate Priestess. 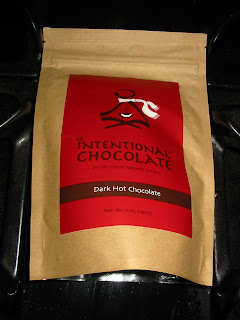 You may recall, Sisters and Brothers, that I have reviewed two wonderful products from Intentional Chocolate in the past and loved them both. Sadly not everything a company makes can meet the standards of The Chocolate Cult. They sent me this 7oz bag of their "Dark Hot Chocolate" and reading the instructions I could see this would have the consistency of a sipping chocolate rather than a hot cocoa drink. That means it would be thicker and richer but the bag said you could add more water or even milk to change it it you wanted so I added an extra amount of water which seemed to create a more hot cocoa like link that still looked thick and rich. The smell was amazing when I opened the bag and when it was mixed. Clearly there was cinnamon in the spices added to the products, spices that are not specified for so if that is an allergy concern you are forewarned. The solid chocolate pieces were much lighter in color than I expected 68% cocoa content as the label listed but they melted and blended with the hot water very well as you can see in the photo below. I shared it with three others and got their perspectives on the drink as well. Unfortunately they all concurred with the opinion I'm about to share. This was a very disappointing chocolate drink. The smell continued to be enticing but the cinnamon and spice nature of it should have been our hint that the cocoa was to to fade on this drink. It didn't fade however, it was simply overpowered by the spices. When it was hot, on the verge of almost too hot to sip, it tasted the best. The chocolate remained smooth, the cocoa was still there through not the principal essence. Then it started to cool off and it cooled off quickly and this created several problems. First, the spices completely overwhelmed the cocoa flavors and it was like we were drinking cinnamon -- not what we want here on The Chocolate Cult. Second, the flavor intensified and become too powerful even for the cinnamon lover in the group. Finally the chocolate started to separate from the water and formed a grainy texture that was unpleasant. Add to all this that this one bag made 7 servings (very small servings I might add) with 99 calories, 7g saturated fat, 9g sugars, and 1g protein, and there really aren't health benefits here either at 68% cacao to make it worth your drinking. While I can still recommend the solid chocolates from Intentional Chocolate, I can't recommend this product especially when this is a not a dollar purchase from Kroger as a previously bad hot cocoa we revealed here was. A few months ago I found these two boxes of "Cacao Reserve" chocolate from Hershey's in the clearance section of my local Kroger which you know is one of my favorite places to look for candies I may have missed. I saw some reports the product line had been discontinued but just this morning as I'm working on this for you, Sisters and Brothers, I see you can find this product lines at several stores just using the most basic search. I think you should find them and give them a try. 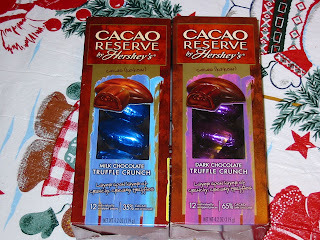 I tried two varieties, "Milk Chocolate Truffle Crunch" and the "Dark Chocolate Truffle Crunch" -- the first has a blue box and the pieces are wrapped in blue foil; the second has a purple box and purple foil over each piece. Each piece is o.35oz of chocolate and four of them equal one serving. The milk chocolate is visibly lighter in color than the dark but, here is my only caution in this review, the dark chocolate is 65% dark not the 70% you need for the health benefits to kick in so each these for a treat or for the taste, do not tell yourself these are healthy. In comparison, the darker pieces are a bit better than the milk chocolate. A serving of the darker variety has 20 less calories, half the sodium, 3g more fiber and 5g less sugars plus 1g more protein as well as more vitamins and minerals. Both taste great. The chocolate is smooth and cool, the inside provides three textures to explore: hard shell, semi-soft center, and the crunchy "bits". Chocolate is the first ingredient and there are no artificial flavors though it is unclear if some of the color is artificial. These taste so rich and are so big individually that I think you can easily control how many you eat at a time or in a day if you take the time to fully experience each one. To learn more about these two great products you can find them HERE. Today, Sisters and Brothers, I want to see a lot of comments left for our very own Chocolate Coconut Acolyte whose birthday it is. By the time she sees this tomorrow afternoon, I hope you will have left her at least a dozen well-wishes for all that she does for us. She sacrifices herself to eat any chocolate and coconut offerings we are sent, she takes pictures of them then write a full five-sensory review of them which I then include in our Sacraments. She attends Pilgrimages and events with me and on her own when she can. She reports to me on special chocolates she finds and promotes us wherever she goes. She routinely comments here as well. So please join with me to say "Happy Birthday, Mavido79!" Your Chocolate Priestess did receive one chocolate food gift this Christmas from a friend she's known since high school, which was two plus decades ago now. My friend Lori came to our annual Holiday Party and she gave us this beautiful little box from Godiva. I appreciated it even though it also felt a bit awkward since out of financial concerns our gift to our guests was all of the homemade entrees, side dishes and treats we made plus hours of games with silly prizes. 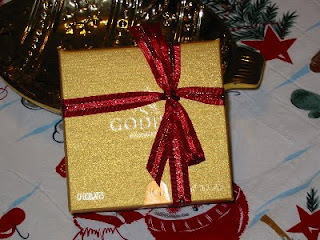 I wanted to share what was inside this gold box with you are because Godiva, like many other stores, may still have them in stock at a discount today and this coming weekend. The box itself didn't have a name or title so I can't give you that information. Inside was four pieces, each a different shape, and sadly not labeled which meant I couldn't safely share it with the other member of my household here over the holidays since he has a tree nut allergy and hazelnuts were on the ingredients list. I gave him other treats while I tried these. The Star was white chocolate with a deep, rich raspberry liquid center. 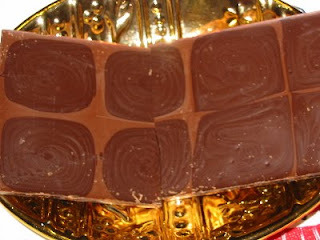 The Square was a chocolate caramel covered by dark chocolate. 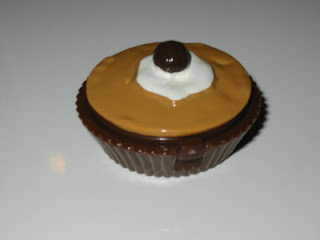 The Heart was milk chocolate over a soft hazelnut filling. The Oblong was dark chocolate over a semi-solid chocolate filling. 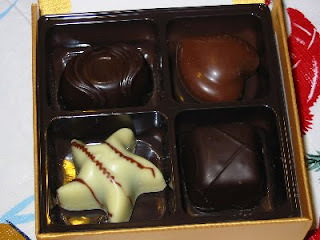 These all tasted like I'd expect from Godiva and I had a nice time enjoying them the day after Christmas. Thank you, Lori! Back to our friends at Astor Chocolate for our day-after-Christmas Saturday Sacrament, Sisters and Brothers. This might surprise you, but your Chocolate Priestess did not receive chocolate as gifts, nor did I eat a lot of chocolate yesterday. 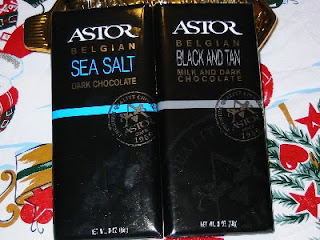 Even so, given the holidays, I wanted to choose a small Sacrament, and these two 3-ounce bars from Astor fit that requirement, even though they are big bars themselves. Remember, what you experience when I do these Sacraments or reviews is never a result of my eating the entire offering or product — I eat only enough to reveal them to you in all five senses, and then I share the rest with family and friends. I'm going to start with the "Belgian Sea Salt Dark Chocolate" bar. The black paper wrapper opens easily, as does the gold fold inside. Sadly, it looks like it broke in two in transport, but it broke almost evenly along one of the columns, as you can see in the picture; each column is made of four sections resulting in a bar that measures 6.5 by 3 by 0.25 inches. I snap off one section and release the aroma of dark cocoa and a light salt scent. The chocolate is dark in color and smooth to my fingertips. The ingredients reveal no artificial flavors or additives, only dark chocolate and sea salt, and this is free of all animal products, for those Sisters and Brothers looking for dairy- or animal-free chocolates. It does have soy, however, if that is an allergy concern for you. 1 bar is equal to 2 servings, each containing 200 calories, 8 grams of fat, 240 mg sodium, 3 g fiber, 19 g sugars, 2 g protein, and 15% of the daily iron an adult needs. After I finish looking at all this information, the scent urges me to taste, so I bite a section in half. While the salt scent is only slight, the taste is definitely there. It is easy, very easy, to let salt overtake chocolate, even the darkest variety. At first the salt blends well with the bitterness of the cocoa, but then it remains the only aftertaste. I try another bite, letting it melt in my mouth, and this releases more of the chocolate and dampens the saltiness. My advice is to let this bar melt to decrease the salty part of the taste. I cleanse my mouth and then look to the "Belgian Black & Tan" bar. 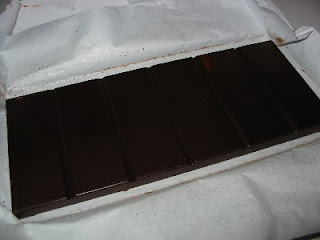 On top it looks like a milk chocolate bar, but when I turn it over, as you can see in the photo to the left, I can see that its sections are infused with darker chocolate —thus the name "Black & Tan," for the milk and dark chocolate. This bar also broke along one of the five columns. It has the exact same dimensions as the previous bar but slightly different nutritional values, with 220 calories, 8 g saturated fat, 5 mg cholesterol, 20 mg sodium, less than 1 g fiber, 21 g sugars, 3 g protein, and 6% of the daily iron and calcium an adult needs. It has both milk and soy in it, for those with allergies or concerns about such information. 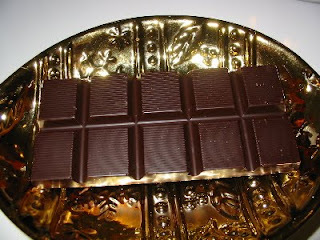 The fragrance is primarily milk chocolate, though if I turn over the bar to the darker circles I get a hint of dark. 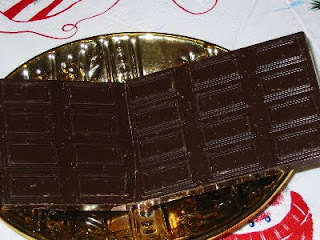 Looking at the bar sideways where it has broken I see that each section is mostly darker chocolate. Again I break off one segment, and this releases more dark cocoa aroma. Eating one with the milk side down reveals a very creamy, gently sweet taste with a hint of bitterness at the end. Eating it dark side down I get more of a slightly bitter taste with a creamy afterglow. This means you can decide which flavor to focus on when you eat it, and I think that is very fun and possibly engaging to the consumer. At $4 a bar and with six flavors to chose from, these 3 oz. Astor bars are a good value for their taste. 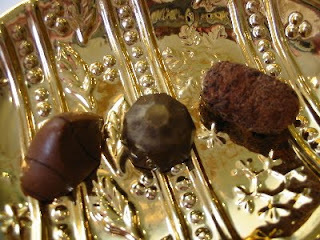 The chocolate is high quality, and the taste is varied, so you can decide what you like. I preferred the "Black & Tan" in terms of overall taste today, since I found the other a bit too salty. I've never seen these in local stores, but you can always visit their website links I've provided. Whatever your next holiday or gift giving occasion, you should check these out. In 2010, your Chocolate Priestess will start doing movie reviews that relate to chocolate. I'm going to do this as a change of pace and because movies can make great gifts. Also I've received three movies myself that relate to chocolate and doing reviews for my Sisters and Brothers in the Sacred Substance is a good excuse to watch something closely. Now, these won't be reviews focused on cinematography or directing and true portrayals to the original book. Just fun reviews that focus on the role and function of chocolate in the film along with a link or two to where you might buy it yourself. What else is out there? What else involves chocolate but may not have the Sacred Substance in the title? 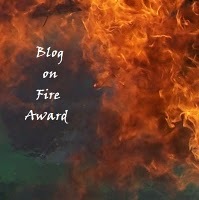 Let me know and help me make 2010 interesting reading for you all. I won't post tomorrow since my household celebrates Christmas but Saturday will be a Sacrament so make sure you come back on the day after Christmas. The last time your Chocolate Priestess mentioned Nestlé it was to condemn one of it's products, another cocoa mix. Today I get to say positive things about a different flavor from that same product line. A lesson that not all varieties of a product are equal and that you should give each a chance to stand or fall on it's own. 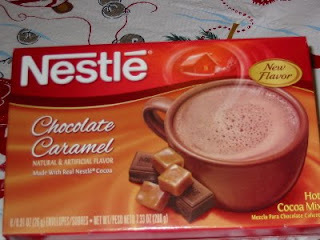 Last night my household tried the "Chocolate Caramel" flavor from Nestlé's latest hot cocoa mix line. I got it for a dollar an 8 envelop box at Kroger a while ago when I bought the very sad "Chocolate Mint" and the yet untried "Dark Chocolate" varieties also for a dollar a piece. Each box has it's own look and this one not only pictures pieces of caramel and chocolate but a big waves of caramel under the mug to give you a sense of what you are about to taste. Caramel is indeed what you get here. Just opening the envelops released a burst of caramel fragrance; the first hint this had to be better than the previous flavor I've revealed to you all, Sisters and Brothers. The key to getting the full potential is to use only 6oz of hot water as recommended so I carefully measured -- which didn't fill this mug up at all. The mix had to be stirred a few times as it cooled but overall stayed relatively mixed. The taste was very much caramel and it overwhelmed the cocoa flavor which isn't great as far as The Chocolate Cult is concerned. That it had any positive flavor at all though moves it into the "decent" category IF you prefer strong caramel flavors. If you want to use a bigger mug, make sure you use more than one envelop or the it becomes flavored water. Using milk might make it more creamy tasting so I'll try that next time and let you know if that improved the taste. Overall this has a lot of additives and artificial flavors, chocolate is not one of the first ingredients. Given that I found it for $1 it was a good deal if you can find it on sale yourself. This flavor gives me hope that the next variety I try might try may make the "good" category. Sisters and Brothers, your Chocolate Priestess got the last of her stocking stuffers this morning at her local Hallmark store when she picked up a few cards using her Gold Crown membership card. While I can't at this point reveal what these four treat look like or taste like since they are gifts for someone else, Russell Stover usually has decent chocolate that is a safe bet for their price. Once these have been opened, I'll return to this post and add a few more photos and give you a second-hand report on how they tasted. 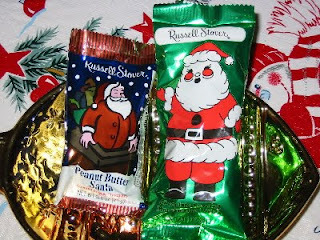 I got two treats with a "traditional Santa" on the wrapper. 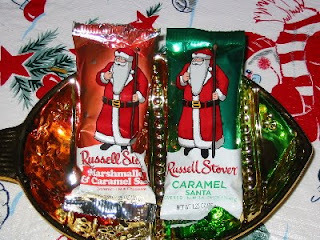 Both have caramel in them, the green wrapper is simply a caramel center while the red one should have both marshmallow and caramel. The shell, which I assume will be Santa shaped, is made of milk chocolate. These cost 59¢ each and were on the candy counter near the check out. The other two stocking stuffers I bought this morning are these: a marshmallow Santa and a peanut butter Santa. The marshmallow's wrapper has this very fluffy Santa and I bet that is intentional to make you think of fluffy marshmallows. The peanut butter is the smallest of these four and is 10¢ less than the other three. All four of these should be things the Milk Chocolate Acolyte will like to find in his stocking on Christmas morning. Sometimes I find chocolate related items in places I didn't expect. Take this for example: "Chocolate & Hazelnut Lip Gloss" made for Borders Inc. I found it in Borders less than a mile from my house in that check out aisle they create with racks of books and other products to try and catch your eyes on the way out. This 5.5g gloss was about $4 but I was spending some birthday money and a coupon I had so it ended up costly me nothing really. Given the title I expected that it would remind me of Nuella or other chocolate-hazelnut treats. Actually it smells like chocolate and caramel once you open it up, use the slightly bigger latch to open it, the other is just a hinge. The scent is very strong and as you can see in this photo inside it looks very creamy. When I dip a finger in, it feel very sticky and gooey just like you might expect a chocolate caramel to be. While the fragrance lingers it doesn't taste like anything at all though it will make the person you are talking with look at you and perhaps take a sniff. There is nothing chocolate in it by the way and you definitely should not eat it. So for something just cute, small and fun, see if you can find this at your local Borders and slip it into someone's stocking or gift bag or card even for the Holidays. At under 2 inches in diameter, the possibilities of where you can hide it among the other presents or where the receiver can carry it are almost endless. Obviously this isn't for little kids who might think it is edible but I'm 40 and I think it's delightful as did the acolytes who smelled it on me. 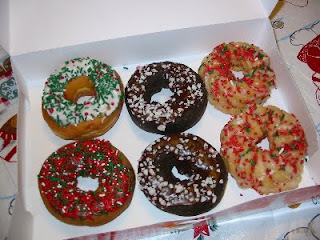 Dunkin' Donuts is offering some Christmas themed donuts right now and so your Chocolate Priestess stopped in to her local Kroger's branch of the donut shop and bought a half dozen with four varieties. Four vanilla donuts -- two glazed crullers, a cake with sprinkles and frosting, and a yeast with sprinkles and frosting. And then the only two chocolate ones they had at around 10AM -- chocolate peppermint. Normally a donut there is 89¢ but for half dozen it is about 80¢ plus local tax. These donuts around approximately 3.25 inches in diameter and about 1.25 inches thick. They have a very chocolaty smell, a very cake-donut scent as well, but the sprinkle of peppermints on top don't really have a fragrance that I can pick out. They are firm but still very soft the next day when I eat them. They have a very solid cocoa flavor, not sweet at all though the chocolate frosting has a hint of sugar and the peppermint scent is released as I chew along with a very light coolness in my mouth. 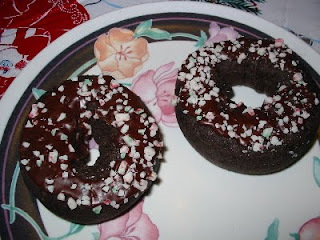 This is a donut for those of us who don't want a sweet morning pastry but still a solid dose of cocoa. The cake quality will require you to have something to drink with it. I liked it a lot though I can't say it is my favorite yet of the chocolate varieties from Dunkin Donuts, which needs more chocolate I think. Today's Sacrament will look at the final group of products that Theo Chocolate submitted to us for review. 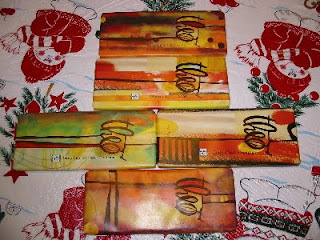 These are five different flavors of their 3-ounce "Theo Origins" bars. 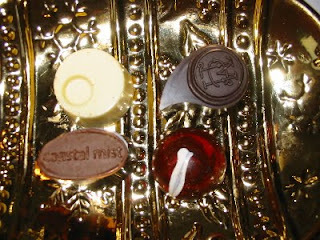 You can find your Chocolate Priestess's earlier revelations on Theo's Nib Brittle back in April 2009 and their 2-oz. bars in August 2009. What are "Theo Origins" bars? These are five flavors created from single-origin cocoa from five different regions of the world. Each bar will highlight the unique flavors that the earth itself gives to cacao beans, unaided by anything other than a bit of added sugar — no milk, no soy, and no artificial flavors, so these bars qualify as vegan and dairy free. Each of them is 65% or higher cocoa content, so choosing these as gifts is also giving your loved one the healthier chocolate you've been reading and hearing about all year long. These are the very first products you see on their website under the "Shop Theo" tab. For some reason they are only featuring three of their five flavors online right now, but look in stores for the other two flavors I am going to witness to you about today. It is quite possible that different regions have had problems with their cocoa crops or Theo has changed flavors since these were sent to me. I can only reveal what I have been sent, Sisters and Brothers. As usual, I will work my way from the least to the greatest cocoa content. Each bar is 7 inches long, 3 inches across and just over a quarter inch thick. That means I start with the "Madagascar 65% Cacao" bar — although it produces very little cacao right now, this island is starting to make its mark in chocolate. This bar has broken into three uneven sections during shipping, even though the bar itself is divided into six rectangles. Not surprisingly, the scent is dark cocoa, and I know it will just get more intense with each bar. I break off a half section with a snap and take a bite. It has a slightly grainy texture to it, though I can see no reason for this with my eyes. It has a changing flavor, starting very bitter, becoming almost a bit buttery, then taking on an indefinable spicy sensation which the wrapper describes as "wine" like. I can say that I've indeed had wines like this. Next I'll go to the world's biggest cacao producers for the "Ivory Coast 75% Cacao" bar. 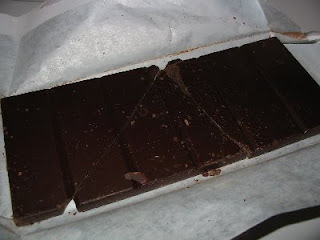 This bar didn't break during shipping, but at 10% high cacao content it is oddly not much darker than the previous bar. It has a slightly strong scent and a much sharper bitterness when I take a bite that smoothes out with each chew. 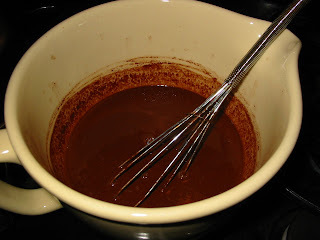 The result is a less complex flavor but still a solid, intense cocoa that creates a small buzz with just a half rectangle, or 1/6th of a serving. The "Ghana Panama Ecuador 75% Cacao" bar is really a triple-origin bar, combining cacao beans from the three different regions listed in the title. This is identical in appearance to the previous bar, but the scent is less bitter. The chocolate starts more creamy, then turns a bit bitter and acidic as I chew a half section. There are interesting switches in flavors if you eat it slowly enough to track them and let the cocoa rush build up. I am sent firmly back to Africa and to the second largest cocoa producer in the world with the "Ghana 84% Cacao" bar. At this level you really need to know the person you are buying chocolate for. Most people, when they say they like dark chocolate, are talking about the 60-80% cocoa range; few can enjoy the higher cocoa content. Again this does not look any different from the previous bar, so I won't take a photo and slow down your loading time today. It has a very deep, rich cocoa fragrance when I open up the wrapper. The bitterness is there, but this time with a very natural, floral flavor that I can't specify beyond that. It makes my tongue and mouth pucker up a bit, though with each bite of this half section my senses adjust, and I'm either flying so high from the buzz or simply getting so used to the intensity that it seems almost sweet by the end. Finally, we go back to South America, where the "Venezuela 91% Cacao" bar's raw cocoa is produced. This bar is almost black in color ,but I'm not sure you can fully see that in the photograph. It has a surprisingly mild scent, but when I take a bite it is anything but mild. There's nothing sweet about this chocolate bar, only bitterness that has a strong earthy taste and a sizeable buzz. Each chew releases more tingling through my mouth, making my tongue and mouth pucker a bit. This is not a bar to buy casually; make sure you know who you are giving this one to as a gift. Each of these 3-oz. bars has two servings according to its label, and they don't differ much in content, so I'm just going to summarize for those of you Sisters and Brothers who care. The calorie range is 200-210, saturated fats 10-12 grams, fiber 4-5 g, sugars 4-14 g, protein 3-4 g, 4-6% of the daily iron requirement, and 0-2% daily calcium. There is no cholesterol and no sodium in any of the five varieties. Minus the added sugars, this is close to what cacao itself must offer nutritionally. Theo Chocolate can now be found in stores all over the United States, though their store locator doesn't do justice to how widespread they are. I can find their bars in at least two stores within a mile of my house, Bloomingfoods and Sahara Mart, so try stores similar to "Whole Foods" if you don't have one of those franchises in your area. All of these bars are certified fair trade produced, the wrappers are 50% recycled materials, and the chocolate itself is vegan and organic. Slipping them into someone's stocking or gift bag is also gifting the farmers who grow the cacao and the planet which creates it. You know someone who loves Chocolate. You might love Chocolate. Either way you look to The Chocolate Cult for advice about specific products, news related to cocoa, consumer alerts, five sensory descriptions of wonderful chocolate and honest evaluations that help you decide where not to spend your money. In this holiday season, you can offer those in your life who love Chocolate something fun and educational without calories. 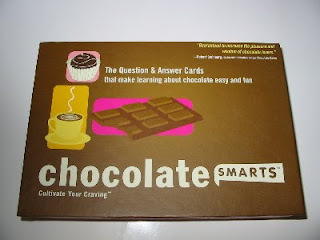 Your Chocolate Priestess received this "Chocolate Smarts" set for her birthday but has waited until now when she knows some of you are struggling to find holiday gifts to reveal it to you. Finding it may be a bit tricky so don't freak if you can't get it before the New Year, there are plenty of holidays, anniversaries and birthdays in your future. Online I found a few stores that carry it and this is the LINK to that search to help you out. I think my friends just found it in a store in our college town so look around, too. Inside there are 60 "question & answer cards" along with a little guide booklet with information about chocolate. The guide booklet is great to read before you tackle the cards but it will not give you must of the answers. The guide offers basic information about chocolate and cocoa, along with an opinion about white chocolate which may offend some of you. 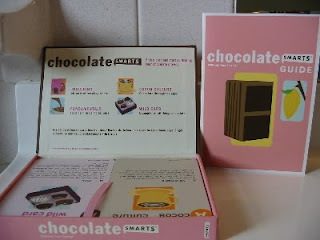 It also has some graphics about chocolate creation and cacao production that you might like. Frankly I think the information on where to find chocolate is far too tiny to be of use; you'll get more resources just looking through this blog in the almost ten months we've been around. 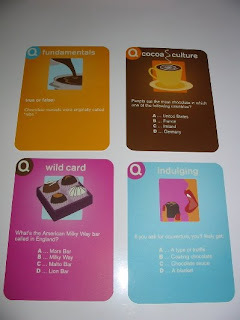 The cards themselves are in four categories: Indulging, Cocoa Culture, Fundamentals, and Wild Card. There are not rules for what to do with the cards but I made up a game that my family played with me. Basically we went through all the cards, I asking the questions, and they answering. If they got it right, they kept the card and at the end the person with the most cards got a hug from me. I know, I know, you were hoping it was a big chocolate bar or something -- Moderation and Purposefulness, remember? According to the cards there were many things we didn't know, somethings we did, and frankly a lot of things we didn't realize we had any knowledge of until we thought about it. You could make up your own game, include chocolate as prizes if you wish. Or you could challenge yourself with them. Either way it was fun and educational and depending on how you use them, totally calorie free but satisfying. How Many Chocolate Holidays does December Need? As you know, Sisters and Brothers, sometimes your Chocolate Priestess mentions various fun holidays, both in the USA and around the world that you could use the Sacred Substance to celebrate. I don't mention them all but I wanted to list the ones for December because I have an important question. Note two different "Cookie" days -- really, we need two cookie days in the same month? Note there are eight days designated for chocolate related "national holidays". This is eight on top of all of the the traditional, cultural, religious, and state recognized Holidays people all ready use chocolate during. This starts to be a concern for me. Let's say you only celebrate one of the religious/cultural/state Holidays with chocolate. Now you add in your weekly Sacred Day to participate with The Chocolate Cult. If you are lucky, the Holiday might overlap with your Sacred Day. Now you want to add in those eight fun "holidays" as well. That's thirteen days you are setting aside to eat chocolate. That doesn't count all of the Holiday related activities or birthdays or anniversaries you may also have in December. Now you can do that but you must do that with thought and care. Remember think about why you are eating/drinking and what you are eating/drinking. Set aside time to truly appreciate it fully. Make sure you eat other foods those days and watch yourself the rest of the week. But beyond these concerns which are always with us here in The Chocolate Cult, does December really need so many fun chocolate related "holidays"? January has only one such day and April none. Why not spread some of the fun "holidays" for November and December, which have so much other Holidays going on, to these months, especially April to celebrate the changes from winter to spring more fully? I wonder how one starts a fun "national holiday"? 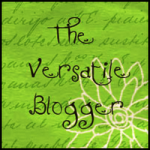 Your Chocolate Priestess has been a book reviewer for many years now, working on her own then for an online bookstore and now as a member of the Vine Program at Amazon.com. 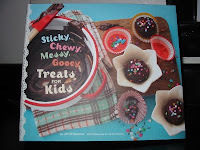 One of the books I was sent last month is Jill O'Connor's "Sticky, Chewy, Messy, Gooey Treats for Kids" and I'm going to review it using the three recipes I tried from it as well as general information about it. Your orders help The Chocolate Cult try new products and restaurants. The version of this book I have is a semi-soft cover with pictures on both front and back. This is the back cover here, the front cover graced the previous paragraph. 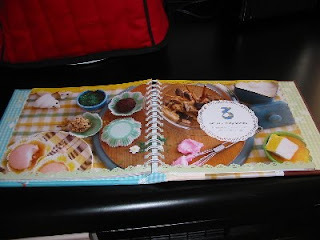 The book has three chapters as well as an introduction to what you'll need to cook these recipes at the front and a list of resources and measurements in the back. 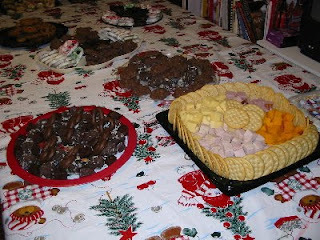 The three sections are breakfast items from one I tried one recipe, every day treats, and party items from which I tried two recipes for the holiday party I reported on yesterday. One of my biggest complaints about cookbooks in general is how they are constructed in an unwieldy fashion. The book is too tall or too wide to fit neatly on a shelf. The book is so thick that you can't lay it flat or it knocks over your book stand you might have to hold your cookbooks. This book avoids those programs for the most part by being 8.5 inches tall and having a wire spiral-bound spine that lets it lay flat. It is a bit long at over 9.5 inches but I think the binding makes up for it in convenience. The pages are scalloped trimmed which makes for a pretty design but a bit odd to feel against your fingers. First thing to note about this book is that it is not made for kids to cook with. The title is bit misleading on this and I was confused, Sisters and Brothers, because the recipes I tried all took a good deal of time to make plus they assumed you knew about how some things should look as an experienced cook. Instead the "kids" on the cover are those who will like to eat or drink these often messy looking and mess-making products. 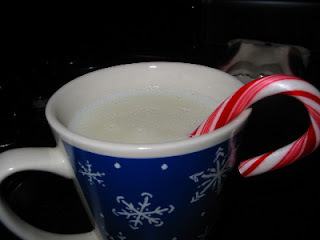 I made the "Pepperminty Wintery White Hot Chocolate" (page 17) first. It has only five ingredients and I fulled it as closely as I could with white chocolate chips instead of chunks I chopped myself. I'm very concerned about sharing copyrighted recipes when I review cookbooks so, sadly, I've decided to err on the side of caution and respect and not share the recipe itself, only details about problems or pleasures I had while making each one. Here you see a cup of the finished hot chocolate. The recipe is supposed to make four servings but I think it made at least six servings myself though that might be because I found this to be a very rich and creamy drink. If white chocolate is your favorite and you are used to whole milk, it will probably taste just right to you. The only problem I encountered in the recipe was that it said to bring to "just about to boil (but do not boil)" temperature. Unless you know what melted chocolate and milk should look like before it boils, I think you could easily overcook this which would not be pleasant. 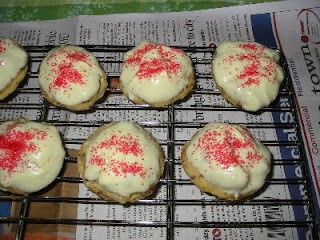 The second recipe I tried was a huge success all around: "Matterhorn Mountain Shortbread Cookies" (pages 65-66). I had make a few adjustments for allergies in the ten ingredient list, especially I couldn't use any tree nuts so I used peanuts and peanut candies saved from Halloween -- see, I told you, Sisters and Brothers, you can save that stuff and just use it later. I also added the red sugar on the top to make it more festive for our holiday party. True, these were a bit more like hills than mountains but there was no picture to compare it to so perhaps these are as they should be. I do wish that the recipe had been consolidated onto one page and the quote about shortbread been moved to the second page. I just find it much easier to follow a recipe when it is all on one page. Overall everyone who tried these loved them. 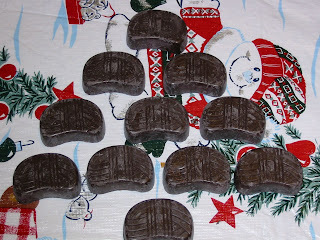 They were a very interesting take on what I normally think of as plain rectangular or round cookies plus they had three types of chocolate: white, milk, and semi-sweet. The last recipe I tried had a picture and that picture told me that I didn't quite get them right; even though I know you choose the best examples for a cookbook. The "Peanut Butter-Pretzel Bonbons" (page 91) really could have used a sketch or two to show me how to roll and dip the bonbons. The measurements here are very precise, just a bit too much peanut butter (which I think I did) made it softer and that made rolls and dipping a challenge. Normally I find you can be off by a bit for most recipes and when that isn't the case, I really appreciate a warning about that. These had a total of only eight ingredients but in terms of time and number of steps, this was the most complicated recipe I tried taking almost 4.5 hours to make from start to finish. As you can see from the pictures, mine were a bit too large and the white chocolate just could not fully coat the peanut butter, sprinkles and jimmies weren't working well either. In the end, what they looked like didn't matter because they tasted great and that wasn't my opinion but the opinions of several guests who came up to me to talk specifically about these treats. So your Chocolate Priestess isn't perfect but you all ready knew that didn't you, Sisters and Brothers? Ultimately the treats were indeed messy to make and to eat. I loved the design of the book itself, but I think the three recipes I tried could have used more directions and less time spent on catchy thoughts at the top and bottom of the pages. The pictures are beautiful but even sketches of some of the more complicated steps would be very useful to the newer or less experienced chocolatier. Finally all three of these recipes took so much time that I'm perplexed about when a mom or dad with kids to get ready in the morning would find time to make them. I think you'd need your partner to keep the kids busy while you make these sticky, gooey items. For most of you, Sisters and Brothers, this will be the second time you've heard about your Chocolate Priestess's annual tradition of hosting a huge Christmas/Holiday party. The first mention was last week when I talked about how I was incorporating Chocolate and our Path into the party planning. Today I want to share how that went with you and later I'll be reviewing the actual chocolate treats I made and the recipes or products I used to make them. 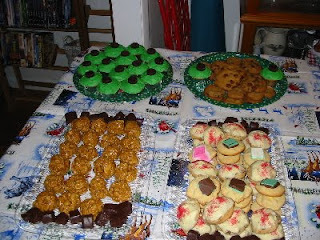 I've all ready looked a the Tollhouse refrigerator cookies which you can see in some of our pictures. All our hot foods and drinks were set out in the kitchen area which my friends all tell me is a "huge kitchen" but I find less than ideal in many circumstances as last night proved to me again. A few folks just ignored the main and secondary courses and moved to dessert but I made sure to give them the full tour and most guests came hungry. In total, my family of three hosted 26 other adults over the course of the evening. The south side of the big table had the rest of our treat including this cheese, meat, and cracker platter. The clear tray north of it had more peanut clusters and what are supposed to be chocolate crackles but when I review that cookbook we'll talk about what happened there. The red lipped tray had more Asher's pretzels, the "crackles" and chocolate caramels. All in all a lot of to look at and chose from. I think my assistant, Tim, for helping me set everything out in as nice a fashion as we could. In all I had 12 containers of treat for this party but by the end I had 4 containers worth left. And yet I don't think I overfed my guests. First, once we moved to the basement, we were all fairly busy and no one really returned upstairs to where the food was until it was time to leave. Some of them used the provided plastic bags to pack up some food but each bag only held so much. Plus most of the guest had soup, hamloaf, mac & cheese, carrots, corn, other food first which curbed their appetites. Over all I think it was a success and I am pleased. I'm also very glad we only do something this big once a year. If you are celebrating Christmas, it's getting close to the deadline for ordering anything without paying higher rates. 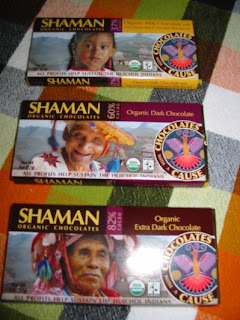 Our last Sacrament before that deadline, which is Monday, December 14th for many companies, is from Shaman Organic Chocolates. They sent me these four bars in modest packaging that made me very happy to see. Remember, saving the land saves the future chocolate that can be grown there. I'm going to treat these as I always do with my full sensory analysis and share that with all of you, Sisters and Brothers, but I'm also going to talk briefly about Shaman and what you are contributing to when you buy their products. They sent me four of their nine flavors of 2oz bars. On each wrapper we see the profile of one of the Huichol people of Mexico's Sierra Madre Mountains. This company was created from the vision of one of their shamans, Brant Secunda, and the profits from the sales of these products they create help support three of their villages, enabling them to fight back against the pressure to assimilate into the urban world not far from them. According to the literature provided with my samples, Huichol may be the last pre-Columbian people who have maintained their traditions unchanged by the rest of the world. If that sounds like a worthy cause to you, Sisters and Brothers, just think how much more you give when you slip one of these bars into someone's stocking or give it to them one night during Hanukkah or use it during any number of winter celebrations happening around the world in the next several weeks. Our Chocolate Coconut Acolyte has this to say about the Coconut bar: "A serving (1oz) of this lovely bar is 140 calories, 6 grams of saturated fat, 0 mg cholesterol, 2 g fiber, 14 g sugar, 1 g protein and supplies you with 1% of your daily recommended allowance (DRA) of calcium and 3% DRA of Iron. However, it gives you no Vitamin A or C. This bar is 60% cocoa, which is the point at which I can usually detect a distinct difference and this bar didn’t disappoint. As soon as I opened the wrapper, the scent of chocolate hit me and became stronger as I snapped off a piece and brought it closer to my face. Just holding it for a moment I notice that it doesn’t melt quickly on my fingers and when I pop it in my mouth it retains its shape for a long time. This is definitely a chocolate that encourages one to savor it slowly. The bite of this level of bitterness is more than some people can tolerate but I find it pleasant. As the chocolate finally begins to melt, I begin to detect the presence of the coconut. The coconut has been toasted which provides some texture but is so finely ground/chopped/minced that it’s almost a moot point. And at 60% cocoa, the chocolate flavor completely overwhelms anything that the coconut would lend to the taste. And that is the only thing I can find lacking in this bar. By the third piece I’m definitely feeling a pleasant cocoa buzz throughout my body. And I decided to stop at that point so I could truly appreciate the sensations awakened by this lovely chocolate." I'll start with the "Organic Milk Chocolate with Macadamia Nuts & Hawaiian Pink Sea Salt" — say that over and over if you can; what a mouthful to say. The added ingredients indicate that the Huichol are not producing all of the ingredients they use but also importing some things. I think that's okay, because generally any region will have a limited number of crops it can produce. One bar is two servings, so an entire bar has 300 calories, 12 grams saturated fat, 10 mg cholesterol, 282 mg sodium, 2 g fiber, 28 g sugar, and 4 g protein, with 2% of the daily allowance of Vitamins A and C along with 4% for iron and 10% for calcium. The bars do vary in nutritional value, so I'll give this information for each one assuming you'd eat the entire bar and not just half of it, especially if you received it as a gift. When I unwrap the gold foil under the paper, the scent is much darker than you'd think milk chocolate should be — that is because it's 37% cocoa content, making this a more European style of milk chocolate than we are used to in the USA. The bar is sectioned into ten pieces, so I break off two pieces fairly easily, then just one piece to try. When it's broken apart, the scent of the nuts and salt gets through to my nose as well. 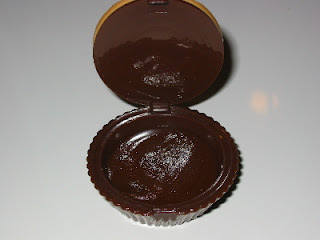 The chocolate is cool and smooth on the bottom and sides; the top has tiny lines etched into it. I take a bite and as I chew I can feel and hear the tiny nuts in it. Wow, after a few chews the salt really powers through, overwhelming the cocoa and the nuts. A bit less salt would really improve this flavor for me. The next flavor is the "Organic Dark Chocolate" with 60% cocoa content, which is about where many people start to have negative reactions to the bitterness that can be part of the cocoa experience. But remember, proven health benefits start at 70%, so eat this bar for pleasure and not for health reasons, though as the nutritional information shows, this is better for you than the 37% bar. This 60% bar has 280 calories, 10 g saturated fat, 0 mg cholesterol, 4 mg sodium, 4 g fiber, 30 g sugars, and 2 g protein, with 2% of the calcium and 8% of the iron you need daily. 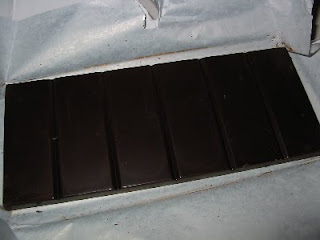 This has a much stronger cocoa scent than the previous bar, Sisters and Brothers, but it also got a bit damaged in transit, though only along the sectional lines, so really it just made it easier to eat. This makes a nice snap when I break off one section. This is a firmer, more solid chocolate, and by itself it makes a light crunchy noise as I chew one bite. 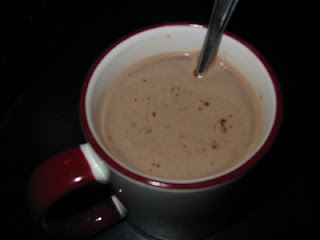 The cocoa rush is very quick, beginning immediately after I finish one half of a one section. This is simply delicious chocolate, and I'm so pleased I eat another section. The aftertaste is wonderful, prolonging the rush and making the world seem a bit brighter to my eyes this morning. The 82% "Organic Extra Dark Chocolate" you can eat for health as well as pleasure. I have to cleanse my palate first, so I can differentiate between the darkness of the two bars. This bar has 320 calories, 16 g of saturated fat, 0 mg cholesterol, 2 mg sodium, 8 g fiber, 10 g sugars, 4 g protein, with 4% of the calcium and 18% of the iron an adult needs daily. This is not to mention all of the benefits several health studies suggest such darker chocolate may offer. Let's see if I can sense anything different in this bar compared to the 60%. The scent is again much stronger than the previous bar when I unwrap the 82%. There is a definite bitterness to start as I chew one section and that bitterness builds up. But I happen to like darker chocolate and this level of bitterness; 85% is where I usually start to get an unpleasant aftertaste. This is very earthy and almost grainy in taste, and it melts very slowly in my mouth. As I open up my full body, mind and soul to the experience, Sisters and Brothers, I feel myself expanding, my vision getting brighter, my body feeling lighter, and my heart calming a bit more along with my breathing. You can't eat chocolate fast, though, not even the really dark variety, if you want to feel this; you have to be in the moment. For pure taste, I think I prefer the 60% a bit more, though I bet I'd love 75-80% cocoa best. For the reactions of my entire being, though, this is the one I'd choose as a Sacrament. Each bar is organic and fair trade certified, and each sale helps the indigenous Huichol people maintain their way of life. 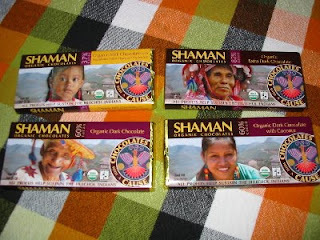 If these flavors sound good to you for someone on your gift list and you like buying chocolate that helps people support themselves, then I think Shaman Chocolates is an excellent choice. If you want something fancier, they also have a gift box of flower-shaped chocolates in a variety of flavors you can choose from for only $8 plus shipping and handling. Hanukkah (or Hanukah or Chanukah), an eight day Jewish festival, begins tomorrow. Your Chocolate Priestess has seen a few chocolate related items online that are Hanukkah related especially Hanukkah Gelt or coins made of chocolate but also cookies and cakes decorated to look like Menorahs and Stars of David. Even though one company told me they were sending The Chocolate Cult something for the holiday, Sisters and Brothers, nothing arrived. So, for this holiday, I can't speak to the quality of any food or drink made from the Sacred Substance nor can I give you comparisons between different chocolatiers nor can I lay out the nutritional information nor can I comment on price options. I call out to you to educate me on this festival. Please, if you celebrate Hanukkah and you use chocolate at any time in those eight days, please leave a comment and tell me about it. Is it a family tradition or something new you've incorporated? Does the commercialization of cocoa treats decorated in gold and blue offend you or make you smile? Please let me know and maybe next year I'll be honored enough to have something to say on the matter first hand in a wonderful full sensory review. I won't repeat all the various links to this big news story now in the States about whether or not chocolate milk should stay on the public school menu. I won't repeat it because much of it is political and that really isn't the point. The concern should be what is healthier for those who may drink milk at school. So let's compare whole milk, 2% milk, 1% milk and skim milk first to see which of these might be healthier then look at what happens when these same milks are made chocolate. This assumes that you believe that children need milk to begin with. I don't want to get into that argument because it is a different matter all together. In order for this article to be of value to you, Sisters and Brothers, you have to assume that milk consumption is a positive for kids in school. These comparisons are based on 8oz servings sizes. NOTE: These are general nutritional information, every brand has added minerals and vitamins, and processes the milk differently so look at the labels themselves. Whole Milk: 146 Calories, 4.6g Saturated fat, 7.9g Protein, 28% Calcium, 26% Riboflavin, 24% Vitamin D, 22% Phosphorus, 18% Vitamin B12, 13% Selenium, 10% Potassium, and less than 10% for several other vitamins and minerals. This was one of two options I had in grade school. 2% Milk: 122 Calories, 3.1g Saturated fat, 8.1g Protein, 28% Calcium, 27% Riboflavin, 26% Vitamin D, 23% Phosphorus, 19% Vitamin B12, 9% Selenium, 10% Potassium. This was one of two options I had in grade school. In terms of calories, fat, calcium, Vitamin D and protein this is a better choice than Whole Milk I think, at least for me as an adult. 1% Milk: 102 Calories, 1.5g Saturated fat, 8.2g Protein, 29% Calcium, 27% Riboflavin, 32% Vitamin D, 23% Phosphorus, 18% Vitamin B12, 12% Selenium, 10% Potassium. I didn't see this option until high school. Now if we compare this to the previous two, unless you are trying to gain weight or need more saturated fat, this seems superior to me. Skim Milk: 80 Calories, 0.3g Saturated fat, 8g Protein, 30% Calcium, 25% Vitamin D, but the other nutritional values were very difficult to find, even the source I used for the other varieties didn't list skim milk separate from yogurt even though they are NOT the same at all. I never saw this option in my public schools but it was what we regularly had at home. Thus at school I usually didn't get milk because it tasted too rich to me unless it was chocolate because then at least I thought there was a reason it should taste so rich. Adding Chocolate Adds: Sugars and perhaps some Saturated Fat. How much honestly depends on what type of milk is being made into chocolate flavor. NOTE: You want chocolate milk, not chocolate drink or chocolate mix here, simply chocolate milk to do honest comparisons with. If you recall when I've looked at Dean's Fat Free Chocolate Milk, my current favorite brand these days, what it added was sugars, protein and calories when compared to it's plain cousins. So if your child normally drank 2% or 1%, a skim milk chocolate version may be healthier for them, it is certainly healthier than the whole milk choice on all levels. So let's be honest, milk is supposed to be good for you because of the Calcium, the Vitamin D, and the Protein it has. When we compare all these types of milk and factor in how likely it is that children will drink it, which type comes out ahead? Frankly that depends on what they get at home. A child who has whole milk will think that skim tastes like water while one who drinks only flavored milk thinks plain is too bland. Ultimately I think this school debate isn't seriously about chocolate or not. It's about over all health concerns and chocolate is only one factor in that. If you don't want kids to drink skim or 1% milk they are all ready getting fats, calories and sugars. Instead of trashing chocolate and other flavors, these concerned people need to look at choosing better brands of milk for the school, better percentages of milk, and then choosing enough variety to get kids to drink it. Chocolate can be a healthy variety if you consider all those other factors. Healthiest milk in the world will do nothing if kids won't drink it after all. The majority of my facts in this article came from one source to lessen bias except when I couldn't find a category of milk such as skim or chocolate. Here is that source: NutritionData. It is rare, Sisters and Brothers, that your Chocolate Priestess is so deeply disappointed in a product that she has to think really hard about each word she is typing out but this product from Nestlé disappointed my entire household tonight. 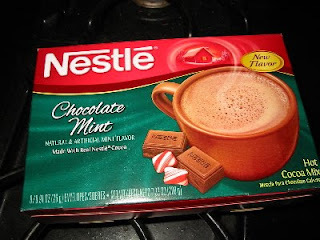 I expect two things from a hot cocoa mix that labels itself as "Chocolate Mint" in flavor. I expect a chocolate flavor and I expect a mint flavor, that's rather obvious, yes? From Nestlé I expect a good chocolate taste with no bad aftertaste. Even though I bought this 8 envelope box on sale at Kroger, I expected this much. It frankly did not deliver even a minimum level of chocolate or mint. It was deeply disappointing for everyone especially the White Chocolate Acolyte who will try other chocolates if they have mint in them; he also chose this flavor to try tonight so he personally felt more annoyed than the rest of us. The mix blended well with the hot water as you can see in this photo, I didn't have to keep stirring it as I let it cool as I sipped it. Normally I have to pace myself because a hot cocoa is too hot to start or it's too rich and I just can't drink it quickly. My first clue that this wasn't good was that the burst of cocoa-mint scent when I added the water disappeared as soon as it came. Then it tasted like a very dully minted hot water with a build up of icky bitterness by the end. I cannot in good conscious, Sisters and Brothers, tell you that this was worth the price and in fact I will not serve it to any guests in my house. Sadly I think we may end throwing it out because I'm not sure it can be saved it by mixing it with another flavor. There just isn't anything there to begin with. If, for some reason, you still want to try this, here are the nutritional facts. 1 serving, one envelope, has 100 calories with 2g saturated fat, 190mg sodium, less than a gram of fiber, 16g sugars, 1g protein, 4% of the daily iron you need but 35% of your daily calcium which is the one saving grace of this product. I know I can get my calcium in more delightful ways. 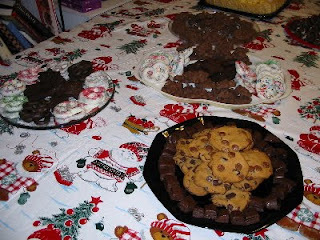 Sisters and Brothers, I will get back to reviews, news commentary, and sharing the exploits I am privileged to have as your Chocolate Priestess but today I want to just briefly talk about how I'm using the Path we are all on to make my family's annual Holiday party more chocolaty but more healthy as well. First, obviously I am using chocolate in as many desserts as I can. I'm going to be making about nine different cookies for this party, which happen on the evening of the 13th. I might make more if I have time. 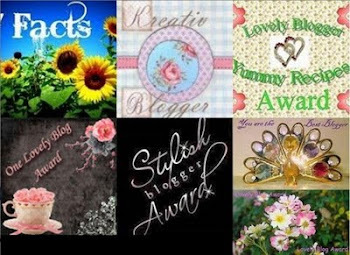 I promise I will talk about them all, share recipes and photos later as I reveal the books I've taken them from to you all next week as ideas you might want to pursue as gifts or for your own holiday use. Second, I'm doing variety this year. Normally I make fudge, yummy bars, one type of cookie, that sort of thing. Nope, the point of having 9+ cookies is variety this year. So my guests can sample white, milk, and varying degrees of dark chocolate. They can see how cocoa or nibs work on these treats or debate the value of coating a cookie verses hiding the chocolate inside. 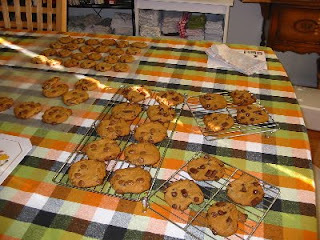 There will be soft, chewy cookies and crisp ones, bars and mounds, perhaps even cupcakes depending on my time. Third, I'm looking at quality. I've carefully checked the ingredients I bought to make sure I'm getting the Sacred Substance I'm paying for. It wasn't always the most expensive brand either especially with white chocolate which you must double check the label or you can easily be tricked into getting something that has no cocoa anything at all. I looked for sales and compared quality. I used coupons even stocking up on supplies and storing them in a cool, dry place. Fourth, I changed my focus on quantity this year. An average party for me might have 4+ pounds of fudge, 4 dozen cookies of one variety, an entire 13 by 9 pan of yummy bars, and an entire bag of dipped pretzels. This year, each cookie variety is 12-20 cookies only and we are using bigger pretzels. 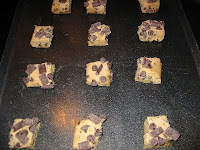 The result is smaller quantities of the individual flavors but more over all number of treats. This also really helps me with time. I can do a treat a day and I don't feel as rushed as I have in previous years. Fifth I also considered health for this party. First, we aren't serving only desserts. Each person in my household, three of us, is making a main course and a side dish. The main course is focused on protein with one solid, tasty vegetarian option. We each are including vegetables either in that main dish or as our side dish. We are using spices over fats to add flavor in everything. I know for some of you this is almost blasphemy but if I use egg whites or egg substitute, lower cholesterol and saturated fats in my offerings, then I feel like I am sending message to my friends and loved one that I care about them. The serving sizes will be smaller, too, and people can come back as much as they want but no one will be focused to eat that entire portion either simply because it was cut that way. Finally, our party will encourage movement and interaction. After the food, which folks can eat at the entire event if they like, we have scheduled games to get our minds active and some body movement as well. Even though the vast majority of our guests will be adults, they actually enjoy this. This year is our 17th Annual Holiday Party. This is year is also the 1st following the philosophy of The Chocolate Cult. Wish me luck. Your Chocolate Priestess was raised in a simple, working class home in the Midwest. We didn't have cookie racks, you know, those metal things that let you put what you've bake up a bit so the air can circulate and cool it faster and more evenly. Nope, my mother used paper bags from the grocery store, cut and then laid out. That's what I used for years until my concerns about health issues made me buy some wax paper. Two weeks ago I got my first cookie racks to use and I used them this past Friday with some refrigerator cookies from Nestlé Tollhouse that I bought on sale and with a coupon at Kroger's a while back. As you can see the rack was much smaller than the sum total of cookies but first let me tell you about the products and how they turned out. I bought three types because the coupon was for three products. Remember to always check your coupons or you can be embarrassed up at the check out when you didn't get enough or the wrong size. I got types that I knew at least 2-3 people in the family would like but then I decided to make these and store them for our holiday party next Sunday, December 13, 2009. 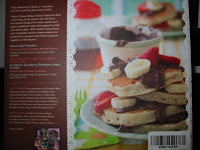 I'll report on that party after as well as reveal all the recipes I'm using when I review the cookbooks I used. These required now knowledge of cooking really but they also aren't as healthy as my homemade cookies are, someday I may share that recipe if you like. 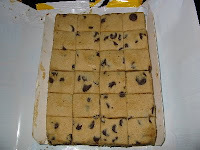 The "Chocolate Chip" package makes 24, 2.25 inch diameter cookies. Two cookies equal one serving with 180 calories, 4g saturated fat, 15mg cholesterol, 150mg sodium, less than 1g fiber, 14g sugars, 1g protein, and 2% of the daily Vitamin A and Iron an adult needs. The unbaked pieces broke off fairly easily and I put them on two ungreased cookie sheets as the directions stated but I had to go for 14 minutes in my oven which while a lovely black to match my kitchen has heating issues even though it is not 8 years old yet. 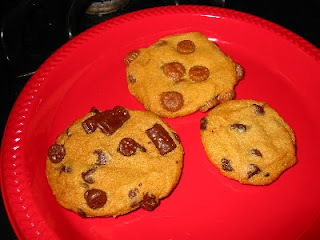 The "Ultimate Peanut Butter Cupts, Chips & Chocolate Chunks" cookies are bigger and the bag makes a dozen 2.75 inch diameter cookies and each cookie is one serving. A serving of these has 180 calories, 5g saturated fat, 10mg cholesterol, 170mg sodium, 1g fiber, 15g sugars, 2g protein, and the same vitamins and minerals as the first variety. The pieces where bigger and oddly some of the little peanut butter cups were on the sides so I moved them to the tops of the cookies because I just knew they would melt onto the tray and burn. These took about 19 minutes to bake. 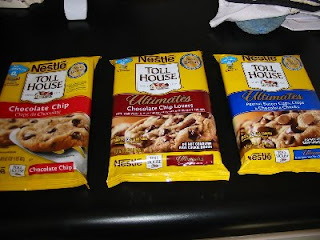 The "Ultimate Chocolate Chip Lovers" has three variations of chocolate for it's dozen 2.75 inch diameter cookies: semi-sweet and milk chocolate chip plus chocolate chunks, I assume the chunks are also milk chocolate. 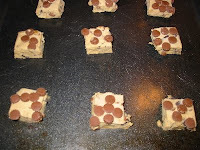 I baked these at the same time as the peanut butter ones since one dozen each fit one of my cookie sheets. I rearranged some of the chips and chunks on top again so they wouldn't melt onto the tray. I paid for them, I want the chocolate in me or in my family and friends, not burnt on the cookie tray. Using the cookie racks did cool them faster but they stuck a bit to the metal as well. Plus it turns out that I needed to put something underneath them because as they cooled crumbs fell onto my table cloth, not a big deal because the chocolate didn't melt on it and therefore did not stain it. Note to Self: put down paper bags or waxed paper to catch crumbs; also need more cookie racks. But how do they taste, smell, look, and all that good sensory stuff? Here you can see a sample of each for comparison. 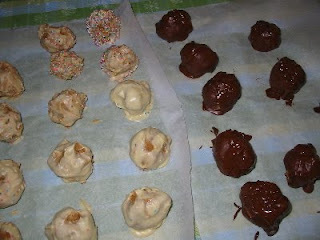 They smelled very chocolaty and in the case of the peanut butter ones, also peanut buttery. But as they cooled the fragrance faded until it was mostly flour and sugars I smelled. The cookies are much crispier than the homemade cookies I normally make, I'm a personal fan of chewy cookies myself but theses weren't took hard and the insides where softer, more chewy than I suspected they might be. I love that I can feel all the different textures of the chocolate and candy pieces, each adds something unique but over all that sugar/flour taste dominants until you bite into a moral or chuck or cup. That's the nature of cookies compared to candies though so these turned out better than I expected. The Milk Chocolate Acolyte got to sample them after they cooled and he really liked them. Let's hope my party guests agree. 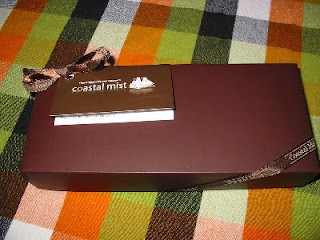 When these truffles from Coastal Mist arrived as an offering to The Chocolate Cult last week, your Chocolate Priestess was impressed with their simple and economical packaging, with nothing extreme or over the top. Inside was this simple brown box with a ribbon and an information card. After taking this picture and logging the product for us on my table of offerings received and schedule to review, I open it, and I am in for a visual and olfactory treat. 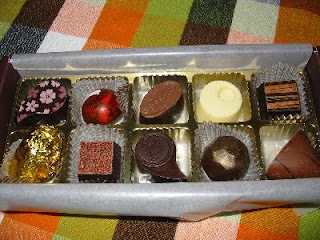 I'll show you more close-up photos as I take you with me today on this Journey through their truffles, but here, just look at the ten lovely pieces in this box. They are well guarded, but not what I would consider overpackaged, with bubble wrap, a protective paper layer, and waxed paper as well, so environmentally speaking this is fine, if not as good as some other chocolatiers who use recycled and organic packing materials. Inside the box is also a tri-fold insert with a photo listing of the truffles that might be in this box, so I get to play a matching game as well. I count 38 flavors on this insert, and on the first page of their website I count 31, which is an interesting difference, since normally I'd think the website would list more flavors. As I look around the website between flavor experiences, I'll see what more I can find — for one thing, on a deeper page where you can order the truffles there are more flavors listed, because you can custom order a box. Beyond the visual, I also immediately smelled the chocolate as well as a mixture of other fragrances before I even folded back the wax paper layer protecting them. As we've seen before, Sisters and Brothers, smell does not necessarily equal taste — one can be weak and the other strong — but what you see and what you smell often entices you to try a food, especially something new. So I am definitely eager to start today's Sacramental Journey. Ten flavors do not neatly divide into a few photographs, so I'll take these in groups of three, four and three. Please consult the appropriate picture if you want a visual to go along with my full sensory description, Sisters and Brothers. 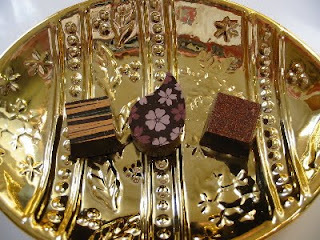 I'll begin with the three chocolates that have inked designs on the top — remember, these are edible inks, so don't worry about eating such pieces of art when you see them in chocolate shops. So I don't have to keep repeating this and bore you, each piece is about 0.75 inches tall, so they fit fairly neatly in the plastic tray in their box. I'll start with the "Criollo Caramel with Nibs" which is the square piece with gold and green lines on the top; it tapers slightly from its 1-inch base, which makes it a square frustum, geometrically speaking, as the Milk Chocolate Acolyte informs me. This has a dark and interestingly spicy scent to it when I bring it to my nose. 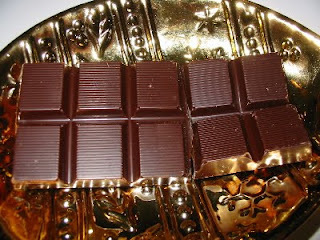 The chocolate shell is cool and smooth to my touch, even the sparkling gold on the top. As I bite this piece in half the bottom snaps easily, but the sides are thicker, and inside is a very soft dark center. As I chew I can feel little pieces of what must be the nibs, and I clarify that by letting the second bite melt in my mouth, which intensifies the cocoa rush and leaves a pleasant bitter and tangy aftertaste. Next I'll try the teardrop shaped 1 inch wide "Strawberry Balsamic," which has pink and mauve flowers on the top. One of the first things I noticed about this collection was that they did not include their raspberry flavored chocolate, and after my small rant last week that raspberry seems overdone, I was pleased to see that Coastal Mists sent other fruit varieties. This piece has an equally nice dark chocolate scent, but when I bite in, the strawberry mixes well in both smell and taste with the dark chocolate. I think I feel little strawberry seeds as I chew and let it melt, demonstrating that this is made with all natural fruit. I'll end this trio with another tapered-square piece that has a reddish marble pattern on top, the "Almond Chipotle Caramel" flavor. This has a kick to its dark cocoa scent, so I take a bite prepared for hotness. The caramel center almost bursts out when I bite, but soon its sweetness is overpowered by the chipotle, which fades in a dozen chews to leave the cocoa and the almond flavors behind. A very interesting interaction between the four distinct flavors results in a unique spicy chocolate that does not leave me gulping water but does open up my sinuses. Just keep chewing if you want to get beyond the heat, or chew it quickly if you enjoy that sensation; the complexity here allows you to choose your experience by altering your approach, and I like that each of you, Sisters and Brothers, is empowered in this way by this variety. I will start off this next set of four chocolates with a white chocolate piece, "Vanilla Epiphany," which is a 1.25 inch diameter short cylinder; the top is decorated with an indented section that has etched waves issuing from it. It smells like white chocolate always does to me -- rather plain and creamy, sort of like whole milk. Inside is a semi-soft white cream with a nice vanilla taste that mixes perfectly with the white chocolate. This is definitely the choice for white chocolate lovers, and one of five white chocolate truffles Coastal Mist offers. I'll counter that with a dark teardrop shaped piece called "Brazil Nut Smoked Salt Caramel," which reads like it should have several flavors. I've probably had a Brazil nut in the past, but it has been so long ago that I'm not sure what they should taste like, and the dark cocoa smell of this piece gives me no hints. Inside is a lightly tangy soft caramel that tries to ooze out after I take a bite, as well as visible pieces of nut that taste very earthy. These two flavors overwhelm the dark cocoa unless you let it melt in your mouth, but then I am left with only the nut flavor, so I recommend chewing slowly to get the most cocoa here. The "Apricot Amaretto" has "Coastal Mist" embossed on the top, which is milk chocolate, but the rest of this 1.5 inch oval piece is darker in color. This is an odd piece, not in what it looks like, but because of a weird lack of fragrance compared to the other pieces so far. Or perhaps I'm floating too high on this cocoa buzz that has built up steadily from the first chocolate. When I bite into it, though, the taste is strongly amaretto with an undertone of apricot, and this seems to bring out the dark cocoa far more intensely than the scent suggested it would. There are even little pieces of apricot in here underneath the top, which provide of bit of sourness and another interesting texture when you let it melt in your mouth or chew slowly. The final piece of this quartet is a stout half globe of deep red marbled color with a streak of white down one side, which identifies it as the "Blood Orange" flavor. This has a slight orange scent to it and again no cocoa scent. This is the smallest of the ten truffles in this box, with a 1.1 inch base and a gently sloping dome that rises up just over half an inch. Inside is a firm dark chocolate with a strong sweet tang of orange. As before, what is inside intensifies the dark cocoa, and this makes my mouth and eyes water from the strength of these two flavors. A wonderful surprise that I am greatly pleased with. The last trio from this box begins with an appropriately shark fin shaped "Kahlúa and Cream." Your Chocolate Priestess is not a drinker. Oh, she'll have some wine every now and again, she's tried beer, and of course she's had alcohol flavored chocolates, but she doesn't know if she's had Kahlúa. I hope our Mocha Acolyte forgives me, because I want to try this, despite the fact that Kahlúa is a coffee flavored liqueur, since the information I could find says it should be a heavy and sweet flavor as well. Oddly, I've always associated the term "Kahlúa" with Hawaii for some reason, but various sources (including its own website) say it is Mexican. 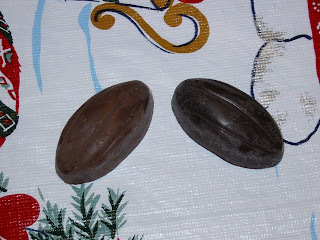 The milk chocolate shell does not have much of a scent, but when I bite through it's thinness I get a burst of coffee, sugar, butter, and cocoa in a soft light tan cream. Yes there is a hint of coffee's unique bitterness, but it is definitely countered by the sweetness. Sadly, the chocolate flavor lags behind, though it is there. Next I try the lightly golden tinged, multifaceted "Black & Gold" piece. I have no idea what this flavor may be, and the scent is only dark cocoa. While this shell is smooth like all the others before it, the faceted sides make for an interesting sensation in my fingertips, and the gold shine to it plays with the light in the room. Inside is a firm much darker center with little pieces of what I know must be nibs in it. The result is an immediate uptick in my senses and my mind as the buzz I've built up over a few hours of this journey gets pushed further quickly. If you want your truffle to send tingles through your mind and body, this is the truffle you want to try. Last, but I hope not least, is the oblong "Belgian Style Truffle: Dark Chocolate," which is wrapped in gold foil in the box. This appears to be a hard, dark chocolate shell covered with powdered cocoa and flakes of cocoa, with a powerful cocoa essence when I breathe it in. Inside a rather thick shell I find a light but almost powdery chocolate when I take a bite. 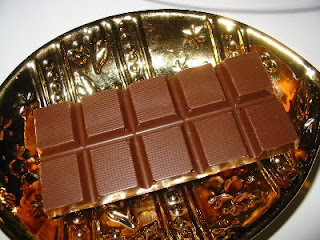 The inner chocolate is smooth and creamy in taste but not in texture, which is interesting. It blends really well with the shell and the outside flakes to make this a great truffle, though I have to say it doesn't change my mind about the "Black & Gold" being my favorite from this box. This box did not come with a list of ingredients or nutritional information, so just remember to think about the flavors if you have allergies and to eat in moderation. If you think these truffles sound like a gift you want to give to a loved one or yourself this holiday season, I would agree. These truffles from Coastal Mist are certainly worthy Sacraments for The Chocolate Cult. But you'd better hurry and order them before you have to pay extra for speedy delivery. Ordering in larger quantities yields the best price per chocolate, but regardless of which box you choose (or if you create your own), the prices are identical. Remember, if you do order from any company who has submitted potential Sacraments to us, please mention that you read about them here in The Chocolate Cult. I look forward to any more samples that Coastal Mist may wish to share with us.